Jeff joined the board in November 2018, and thoroughly enjoys coaching and developing young athletes. Jeff grew up in Columbus OH & New Albany OH where he played baseball for New Albany High School and one year at Cincinnati Bible College. 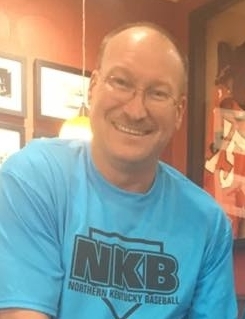 Prior to joining Northern Kentucky Baseball, Jeff was a volunteer in NKYA where he coached the Purple Pythons from T-ball – 13U. Jeff was also on the board at NKYA for 3 years as the Baseball Administrator. Jeff has been part of Northern Kentucky Baseball for the past 3 years coaching the NKY Sharks. Jeff loves the game of baseball and that’s why he has started all over again coaching his grandsons and their teammates. Jeff is excited to coach young athletes to see how they grow while they are learning the fundamentals of baseball. Jeff looks forward to this opportunity to serve on the NKB Board as the VP of 13U.